Every once in awhile, you find a book whose content reverberates deeply in your soul. The words leap off the page in a symphony that takes you away from wherever you’re reading it, whether it be in your bed before turning in for the night or at the end of your lunch break at work. The sentences resonate with what you think and what you feel, affecting you perhaps more than they should be able to. Combine these words and sentences together into paragraphs, pages, chapters, and a book, and you have an otherworldly experience that is the delight of every bookworm out there. The Power of One did that to me. It’s the type of book that should be assigned in high school reading classes. I think that if my classmates and I had been handed this book to read instead of say, The Scarlet Letter, our feeling on literature would have been much different. 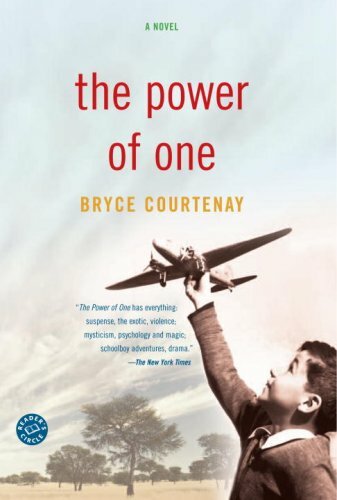 The Power of One was written in 1989, so I can understand it not having transcended to literary classic status (yet), but I think it will get there. The book is a tale that is, basically, about a legend. It’s told from the perspective of a white Southern African boy born in the period right before World War 2. It covers his life as he faces what seems tragedy after tragedy, hardships that no little boy should have to endure. The boy, Peekay, sets a goal early on to become the welterweight champion of the world. Although that may seem like a cliche background to the dozens of athletic autobiographies out there, this one does it a little differently. I can’t go in to too much detail, because I really don’t want to spoil it. Take it from me, you want to read this book. The thing that delights me so about this book is that it really is like a symphony in book form. On one page you will be giggling like a little schoolgirl at the pure naivety and innocence of childhood. Twenty pages down the line, you will feel a hole in your heart as if you just lost a family member. Be sure to bring a packet of Kleenex with you at all times, because you will probably be soaking them with tears – of sadness and of joy – as the characters in the book develop. This book reminds me heavily of my all-time favorite book, Ender’s Game. The combination of physical and intellectual prowess shown in the book make me want to aspire to something more. Does Peekay seem a little too good at times? Sure. But, come on, you can’t help but root for him. It is the same way with Ender in Ender’s Game, yet the story never gets old or corny. It remains delightful and thought provoking the whole way through. There are little nuggets of wisdom, common sense, and thoughts on the meaning of life sprinkled heavily throughout the book. Considering the fact that it takes place during World War 2, and takes place in South Africa when racial segregation was still in full swing, the issues that it tackles are not easy. However, the author has such a simple, straight forward way of wrapping these issues in the tale of Peekay that it fascinates you instead of bores you. The Power of One has made it to my coveted top 5 list and will, I’m sure, stay there for quite awhile. I’m sure my old, beat up copy of Ender’s Game will be happy for the company on my nightstand.